Fly to Krabi and then travel from Krabi to Koh Lanta by bus, which takes a further 2 to 3 hours. Or you can take a direct bus and ferry service from Bangkok to Koh Lanta. Travel by bus and ferry from Bangkok to Koh Lanta takes from 14 hours to 18 hours 30 minutes depending upon which bus company you travel with. There are three departures a day from Bangkok to Koh Lanta to choose from. 18.35 08.35 770 THB Transport Co. The fastest service from Bangkok to Koh Lanta is the 18.35 departure with the Transport Co. (a Thai Government owned company) which completes the journey in 14 hours. The slowest, and also most expensive, service from Bangkok to Koh Lanta is 19.00 departure with Paradive Travel. The journey with Paradive Travel takes 18 hours 30 minutes. The 18.00 departure with Jolly Travel includes a transfer from the ferry pier to your hotel or resort in Koh Lanta. Use the Search Box below to buy your combined bus and ferry tickets from Bangkok to Koh Lanta. Instant ticket confirmation is provided for all services from Bangkok to Koh Lanta. After booking you will be an electronic booking voucher which you need to print out and bring with you when you check in for your journey. 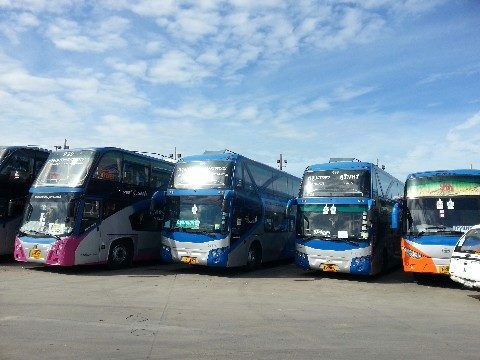 The three companies providing joint bus and ferry services from Bangkok to Koh Lanta depart from different places, arrive at different points in Koh Lanta, and use different forms of transport. Route: This service starts with a bus journey to Surat Thani, where passengers change to a minivan for a journey on a car ferry to Koh Lanta. Once in Koh Lanta passengers are taken by another minivan to their end destination in the Island. Departure Point: Khao San Road Area. Arrival Point: Hotel drop off. Route: This service travels direct from Bangkok to the car ferry pier on the mainland. From Hua Hin Pier it s a 10 minute journey across to Klong Mak Pier on Koh Lanta Noi. The ferry ticket costs 23 THB per passenger. Departure Point: Bangkok Northern Bus Terminal. Route: This service starts with a bus journey to Surat Thani. Once in Surat Thani passengers change to a different bus for the journey across to Krabi. The third and final stage of the journey is by ferry from Krabi to Koh Lanta Yai, the main island in Koh Lanta. Departure Point: Bangkok Train Station. Arrival Point: Saladan Pier in Koh Lanta. Jolly Travel services to Koh Lanta depart from Soi Rambutri near to the Khao San Road. Transport Co. services to Koh Lanta depart from Morchit Bus Station, which is Bangkok’s Northern Bus Terminal. Paradive Travel services to Koh Lanta depart from outside the front entrance to Hua Lamphong Railway Station, which is the main train station in Bangkok. The Paradive Travel service from Bangkok terminates at Saladan Pier in Koh Lanta.